A number of years ago, I heard some stories about ranch and Western life I thought were among the funniest anecdotes I had ever heard. It started a quest. Over a 10-year span, I interviewed 150 cowboys, ranchers, and others, mostly in Texas and Nebraska. The result is Cowboys, Ranchers, and Assorted Characters: True Tales from the New West. It's the best of the best anecdotes from those encounters. 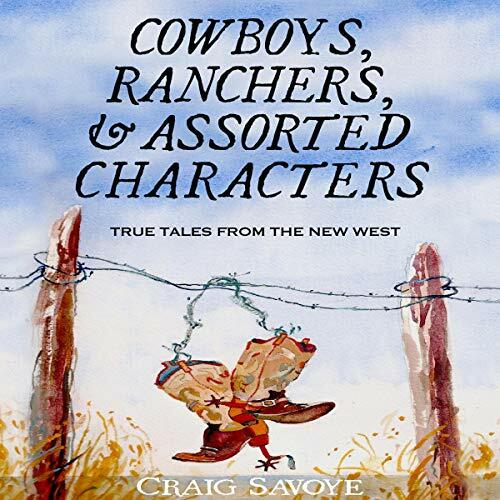 Laugh-out-loud tales of cowboys and cattlemen, ropers and riders, pranksters and brawlers, odd neighbors and crazy bulls, arranged in a collection of 23 profiles/character sketches. For authenticity sake, the narrative voice is toned-down Western vernacular. All Americans - whether rural, urban, or suburban dwellers - have been infused with the cowboy mystique through television and movies. We're nostalgic for the ranch on which we did not grow up. These stories tap into that hidden part of America’s collective psyche. But you don't have to be some sort of cowboy enthusiast to enjoy these stories. Nor do you have to live in the country. The stories' broad appeal derives from the fact that they are simply about people (some of the funniest characters you'll ever meet) whose stories just so happen to come wrapped in a cowboy-rancher-Western theme. This audiobook is everything a wide-ranging general nonfiction consumer is looking for: It’s original, funny, entertaining, well-written, there is strong storytelling, a collection of colorful characters, and a unique setting. Imagine Studs Terkel roaming the West and writing about the people he runs into, and you'll have a good feel for this audiobook. It's just plain fun, and the stories wear like an old pair of jeans. The narrator has the perfect delivery for some down-home folksy humorous stories. For anyone who has ever been associated with the ranching and oil business of the Texas, New Mexico, Oklahoma, Nebraska area this is a happy walk down memory lane. For those who may not have a clue about these things it will be a hilarious series of stories of living in the country. A perfect escape from our daily routines and an opportunity to clear one's mind for the next things life throws at us.